Rani Khanam is one of the foremost Kathak exponents of India. She first learnt under the tutelage of Smt. Reba Vidyarthi. She later trained under Pt. Birju Maharaj for more than a decade. She specialised in the Lucknow style of Kathak, graduating with top honours from the prestigious national institute - the Kathak Kendra in New Delhi. sensitivity to the need for creative expression, her consummate virtuosity is aptly summed up by the renowned dance critic Leela Venkataraman - "... See a consummate artiste like Rani Khanam dancing like an angel moving with light footed ease and leaping with the grace of a gazelle..."
She is recipient of several awards, including the India Foundation Award by India Foundation Delhi; two years fellowship for her research work in Bhav Batana by the Ministry of Culture; Choreography Award by Sahitya Kala Parishad Delhi. Rani is widely acclaimed for her performances characterized by gaiety, grace and strength. She has performed in major festivals of India like Jhansi Mahotsava, Ramayan Mela, Kanthe Maharaj Samaroh, Kathak Jayanti, Bhagyachandra National Festival, Surya Festival, Nishigandhi Festival, Konark Festival, The Khajuraho Dance Festival. Her tours abroad has covered festivals like the Festival of India in U.S.S.R., Forde International Festival in Sweden, India Republic Day celebration in Krijistaan and Tajikstaan, Japan, Singapore, Oman, Sri Lanka and in England. Equally comfortable with the classicism of Kathak as its modern choreographic possibilities. 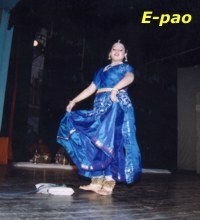 She participated in a major choreographic work "The Peacock" involving Kathak dance, theatre and contemporary dance. She has successfully choreographed new numbers based on the poems of Jaidev, Kalidas and Amir Khusro.